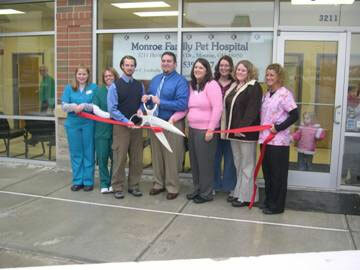 This was my first visit to Monroe’s newest business, the Monroe Family Pet Hospital. I was impressed with everything in the Hospital from the office staff to the layout and furnishings of the facility. It has been designed from the ground up for a family friendly atmosphere. Dr. Jason Tarabrella took me on a tour of the Hospital starting in the lobby and ending up in the operating room. The equipment is impressive, they have the ability to take x-rays, process blood samples and Dr. Tarabrella was quite proud of their laser surgical equipment, he said it reduces bleeding, facilitates quick healing, reduces pain and helps expedite recovery. They also have an isolation area with it a separate ventilation system for animals with infectious disease. The examination rooms are designed with the pets comfort as well as the owners. The pet tables and the owner’s chairs were chosen with this in mind. I met most of the staff on my visit, starting with Aimee when I walked through the door. She was very exited about their new facilities, especially the location. She said that they have only been open for 1 day and have already had 7 surgeries. I met several of the pets in the ICU and recovery rooms. Veterinarian Staff: Aimee, Brenna, Rachel, Mark, Jenny, Tiffany, Sarah, Sara, Deb.